Photo 3 Case-bearer Coleopora sp. I spent the morning of 31st August 2017 indoors, checking botanical records and sorting pressed plants from my summer’s fieldwork. 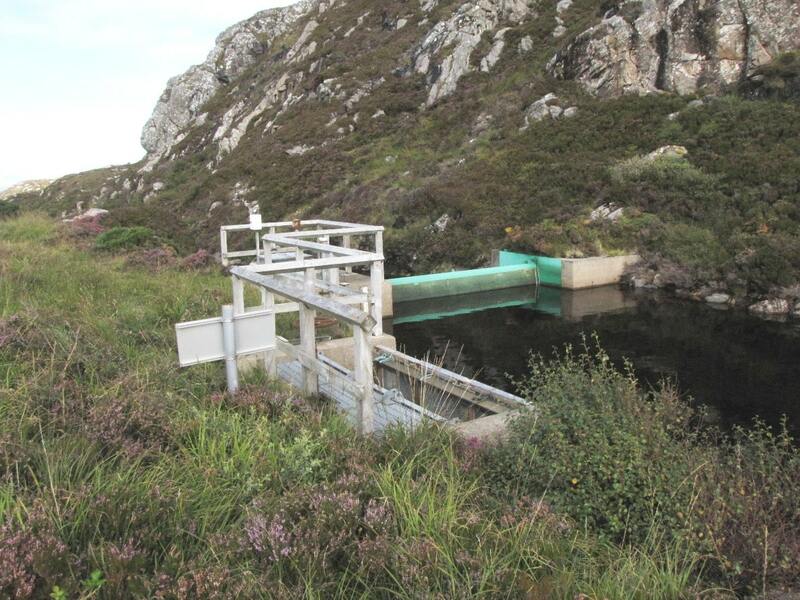 Later in the day I felt a compelling need for some fresh air, so took my car to the entrance to the Assynt Hydro scheme at the foot of Fank Brae, Oldany (NC098323) and then walked about a kilometre up the track to Loch Poll (NC099315), from which the Oldany river flows. The end of August can be a quiet time of year, so I did not expect to see much in the way of wildlife. In the event, I was pleasantly surprised. 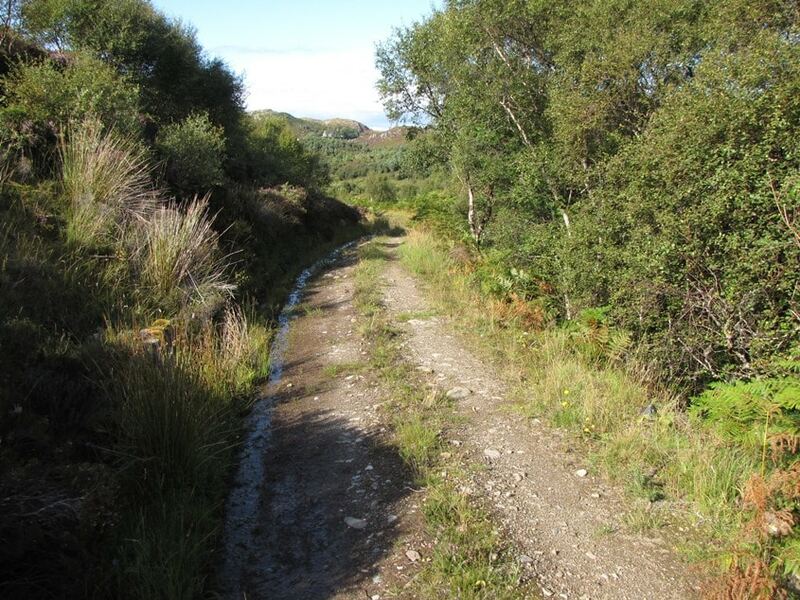 The first part of the track, as far as the turbine house, runs through dense mixed woodland dating back to the planting up of the crofter forestry scheme in the 1990s; it was shady and unproductive. 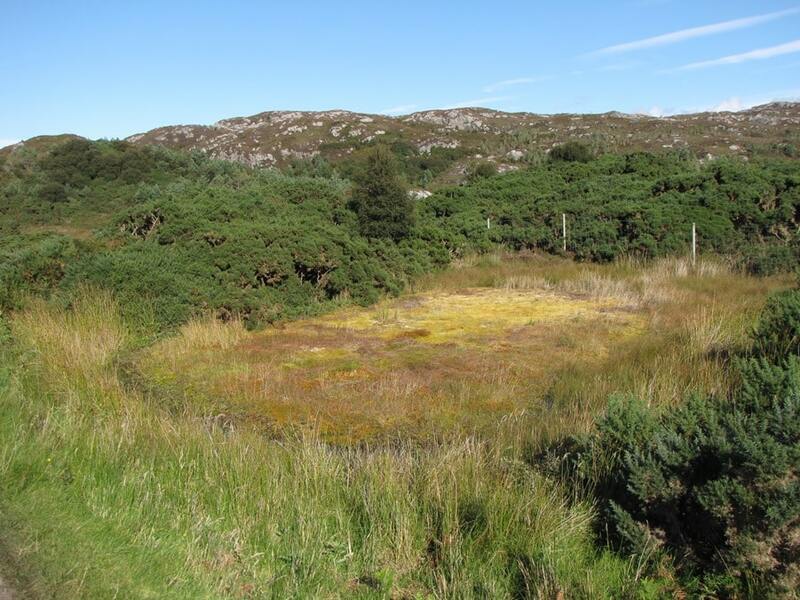 Further up, however, the woodland opens out and the track gets much sunnier, with areas of grassland, heath and bog along its edges, and small pools where burns cross it (Photo 1). 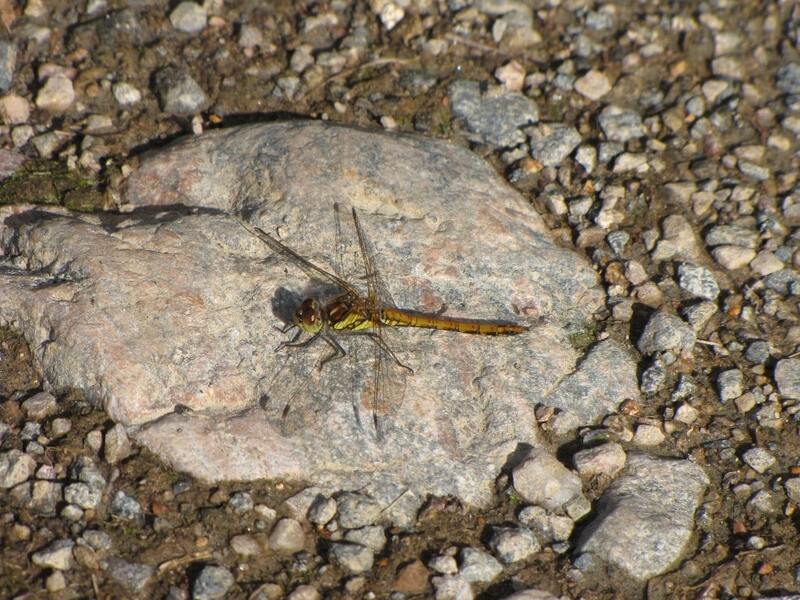 I soon came across the first of many dragonflies, basking on rocks and adjacent vegetation. There must have been well over a hundred along the length of the track, but they were quite flighty, arising as I approached and settling again behind me, so almost impossible to count. They were nearly all common darters Sympetrum striolatum. With patience, I managed to get some pictures, mainly of the yellowish females, delicately marked in black (Photo 2); the males are a brighter orange-red in colour. They were perhaps lying in wait for mates or prey, or, if I dare suggest it, just enjoying the warm sunshine. They lay their eggs in a wide range of water bodies and, being active at lower temperatures than other species, may sometimes be seen into November. I was also buzzed by a larger dragonfly splendidly marked in yellow and blue, a male common hawker Aeshna juncea, which was patrolling the sunny ‘glade’ along the track, but that never stopped long enough for a picture. 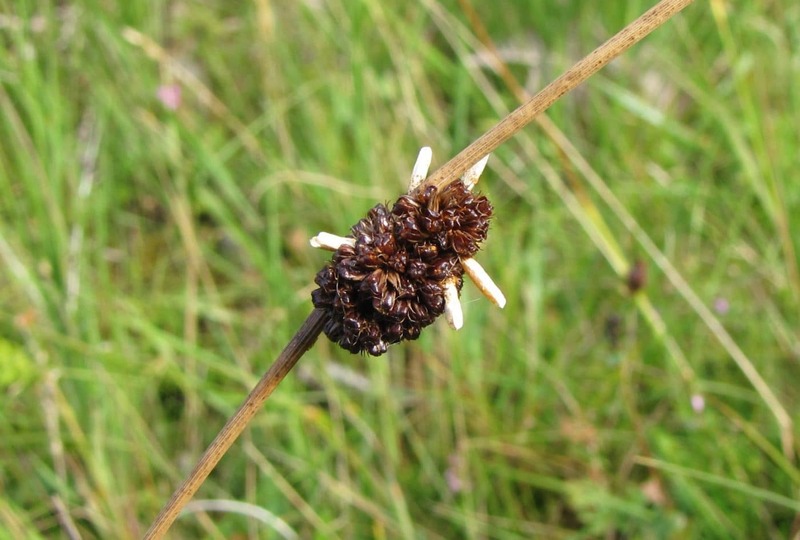 At the edge of track, my eye was caught by some shiny, dark-brown, fruiting heads of compact rush Juncus conglomeratus bearing small white cylindrical objects (Photo 3). They were silken cases housing the larvae of a micro-moth, probably the case-bearer Coleophora alticolella or one of its close relatives. These larvae have their heads down, inside the fruits of the rush, munching away on the nutritious contents, and moving on when they have emptied each one. As they grow, they extend their protective cases with silk. The adults fly in June and July and their precise identification is a matter for an expert with a net and a microscope. 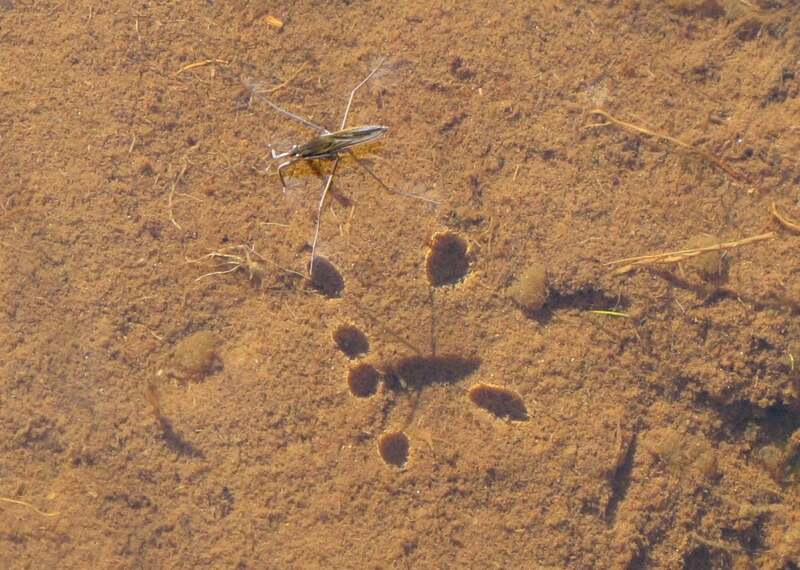 A shallow pool in a rutted section further up the track was temporary home, at least, to a small number of pond skaters (Photo 4). My attention was drawn first to their fast-moving shadows on the muddy bottom, with blobs at the end of the legs, where their feet had dimpled the surface film. These feet are a clever piece of insect architecture. They bear dense pads of hairs that spread their weight and keep them from sinking through the surface film, but also enable them to move around at speed and even jump. The middle and hind pairs of legs do the propulsion, those at the front detect and catch their prey, other insects that fall into and are trapped by the surface film. There were both adults and nymphs present, the former marked by their full wings, with which they can fly to other suitable water bodies. Relatively large (at about 12mm) and dark, closer examination enabled me to name them as moorland pond skaters Gerris costai, a frequent species hereabouts. The gorge below the track is densely wooded, with occasional wych elms adding to the usual mix, marked out by their large toothed leaves which, close up, are as rough as sandpaper. 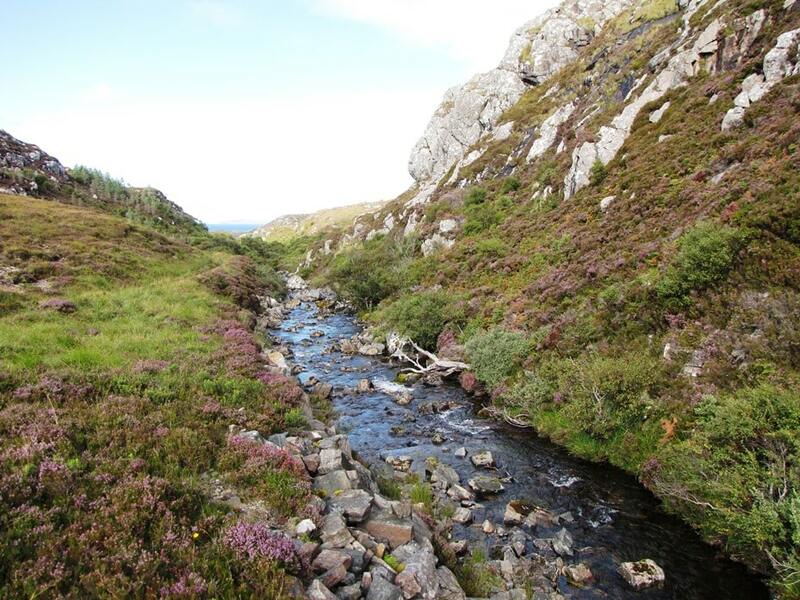 Wych elm is not a common tree in Assynt, often occurring just as single trees on crags, as around Inchnadamph, but there are some steep-sided river valleys such as this which harbour small numbers. There were also a number of old hazel stools, both above and below the track. These are benefitting from enclosure within the fence surrounding the crofter forestry scheme, since deer, although possibly still present in small numbers (from a few footprints I saw) are not browsing off the regrowth at their bases. As I moved out into the even sunnier, but still sheltered, upper parts of the track the insect life became more diverse. 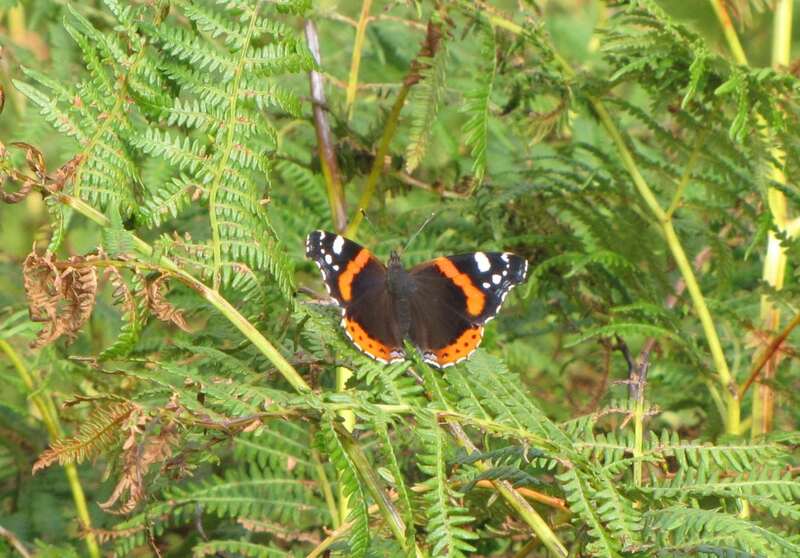 I caught a fleeting glimpse of a light brown butterfly, probably a speckled wood, and had a good view of a red admiral (Photo 5). The latter appeared to be some distance from obvious nectar sources, or nettles, which are the food plant of its larvae, but this species is a very strong flyer so that would be no problem. The track passes through a locked gate, with a convenient high stile (as at the roadside) and then emerges onto open moorland at the edge of Loch Poll. The steep rocky east bank is still wooded in places where it runs at the foot of an imposing crag (Photo 6). I remembered that, back in 1995 (6th July to be precise), Pat and I had found two rather scraggy examples of the local rarity guelder rose on this bank. I hoped that, if still present, they would be displaying their showy red fruits, and scanned the area closely through my binoculars, but could not locate them. 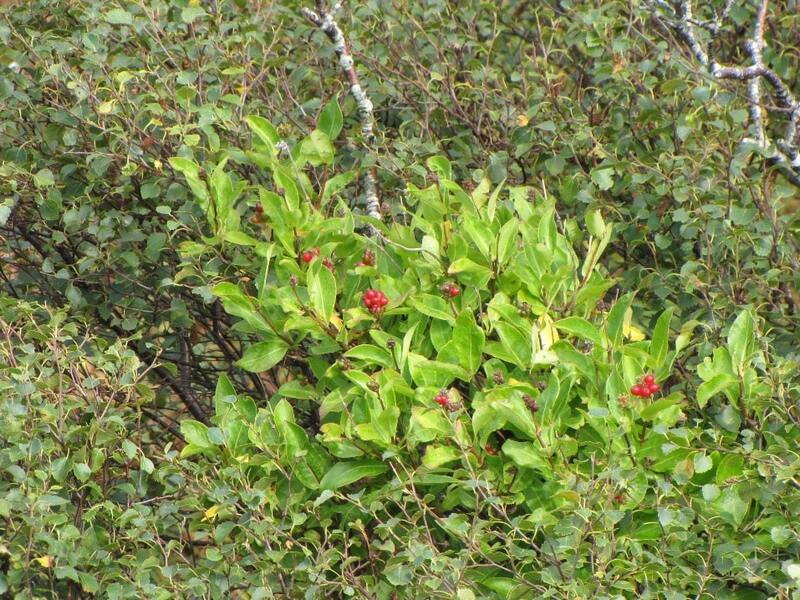 A possible splash of red in one place proved to be honeysuckle in berry (Photo 7), climbing through a downy birch. 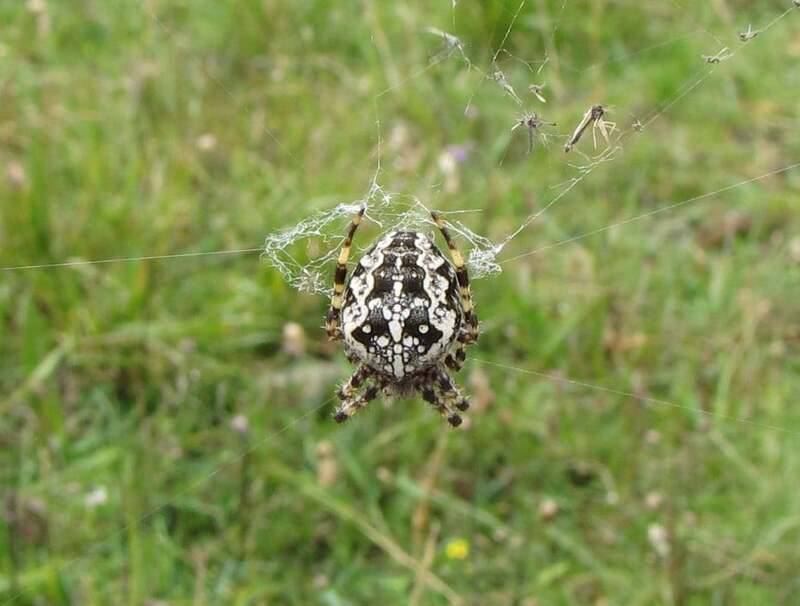 The tilting weir that controls the level of Loch Poll and funnels water down to the turbine house is a sturdy structure (Photo 8) whose safety rails had provided a framework for the orb web of a large, female, so-called garden spider Araneus diadematus (Photo 9). This would be better called crag spider locally, since that is where most of his huge webs are located. It occurs in two main colour varieties, ginger and white or black and white; this was an example of the latter. Construction of the weir and associated works had exposed to the elements two large gneiss boulders (Photo 10). One in particular was typically striped in light and dark bands; the latter are more mineral rich and tend to erode faster, leaving shallow parallel gullies. 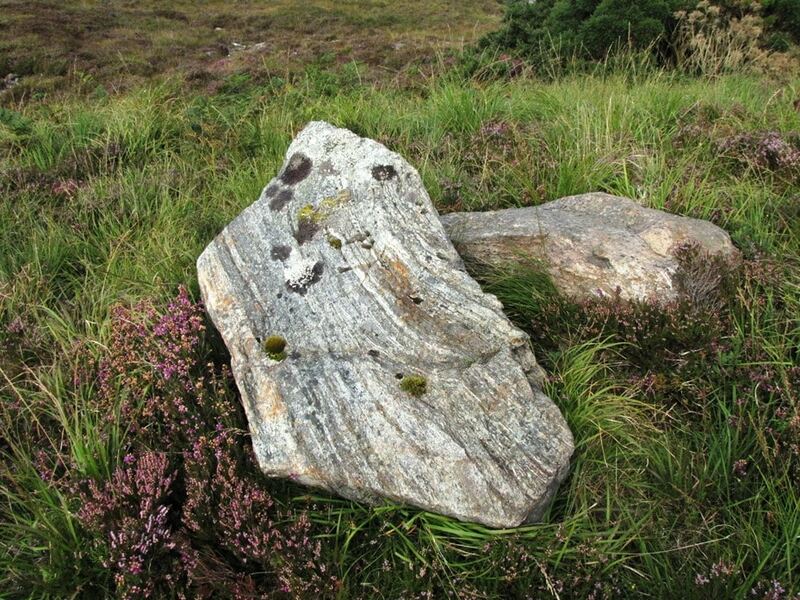 Over the last couple of decades this boulder had acquired an almost complete cover of lichens and mosses, although the colonists were still fighting one another for living space. 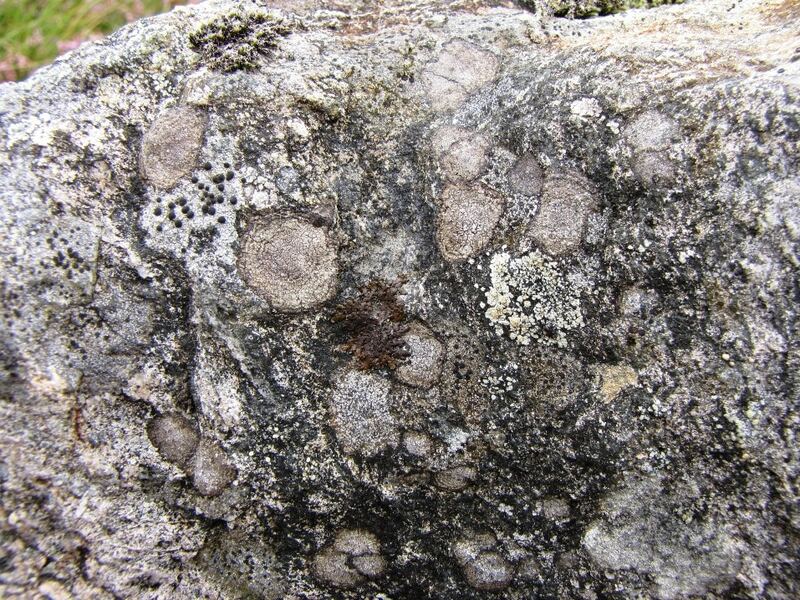 Lichens are probably the first to arrive and its surface supported a mosaic of well over twenty species (Photo 11). They included a number of crustose species, some absorbing iron from the substrate, as they do. 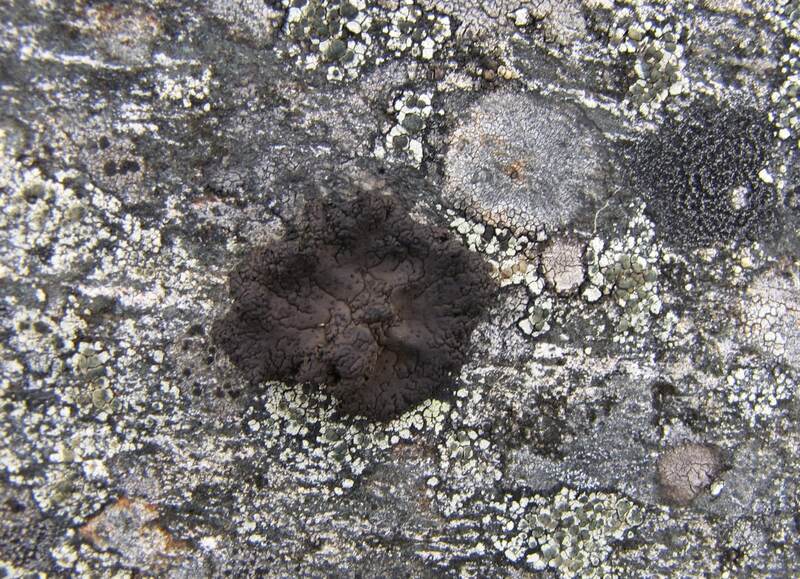 There were a selection of smaller spreading foliose species, with two species of Parmelia (Photo 12) occupying one patch resembling the Chinese symbol for yin and yang, probably P. saxatilis (light) and P. omphalodes (dark). 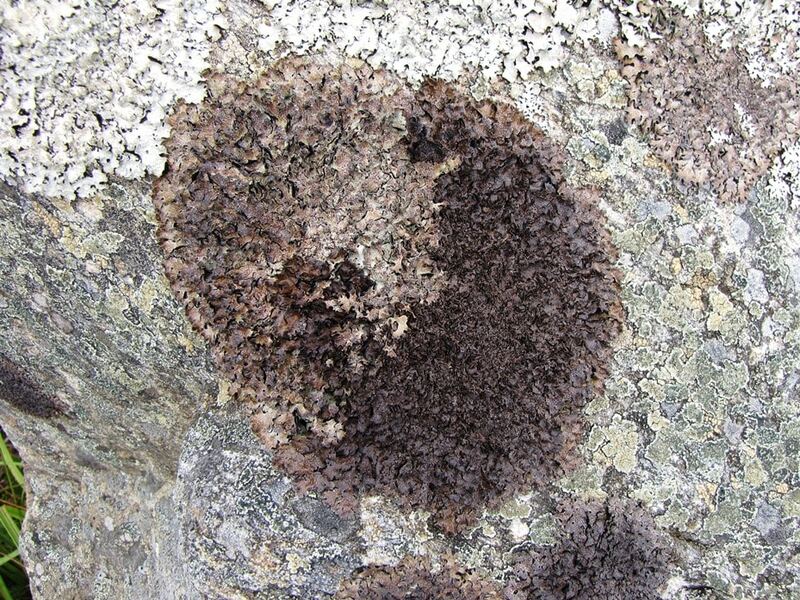 There were also young examples of at least two of the centrally-stalked foliose genus Umbilicaria, U. torrefacta (Photo 13) and U. proboscidea, which are a striking feature of our upland boulder lichen flora. Mosses had also colonised damper areas on the boulder. 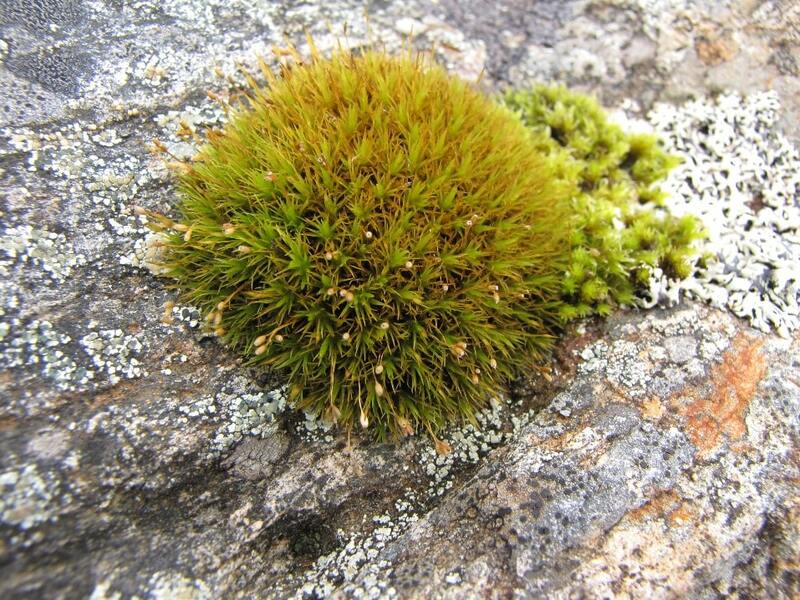 Of at least half a dozen species present, I was able to name two attractive ones with contrasting growth forms which are typical of the gneiss, the starry hoar-moss Hedwigia stellata (Photo 14) and the greater pincushion Ptychomitrium polyphyllum (Photo 15). Having sat for a while contemplating the loch, with just a wren for company, I started back down the track. Late August is towards the end of the flowering season for many species of plants, but ling and bell heather were painting the landscape with their particular seasonal shades of purple. A surprise awaited me beside the upper gate; I cannot think how I had overlooked it on the way up, but may have been focussing on getting over the high stile. 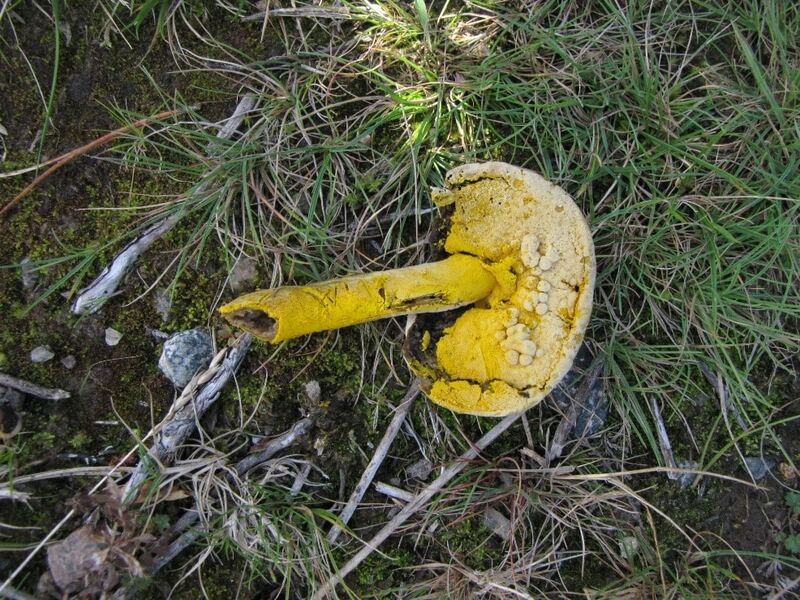 The remains of a small bolete fungus were lying in the grass, covered by a brilliant sulphur-yellow incrustation, probably also fungal (Photo 16). This rang distant bells and on googling ‘fungal parasites on boletes’ I was directed straight to an ascomycete called Apiocraea chrysosperma, which specifically targets boletes. 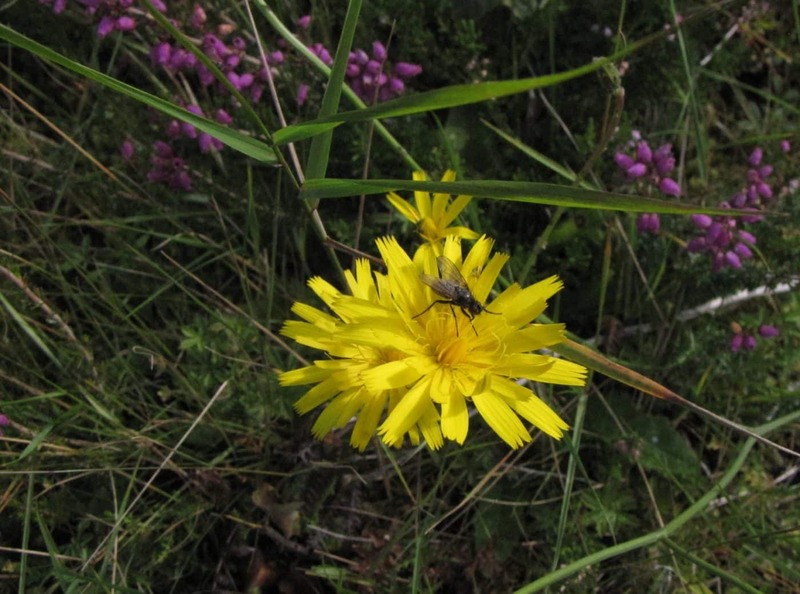 Yellow composites scattered alongside the track were mainly cat’s-ear (Photo 17), which can be distinguished, thankfully, from some of its local look-alikes by the grey-violet colour on the underside of the outer florets and furry wavy-edged leaves. Some of the heads of florets were being visited by muscid flies, a reminder of the importance of this group as pollinators. They belong to a large family, the members of which are a specialist study, so their precise name/s will remain a mystery, as is often the case with this huge order of insects. I continued idly wandering down the track, still in the sun, and with distant views of Handa Island through a nick in the sky-line, making a brief diversion to a small boggy pool at one side. 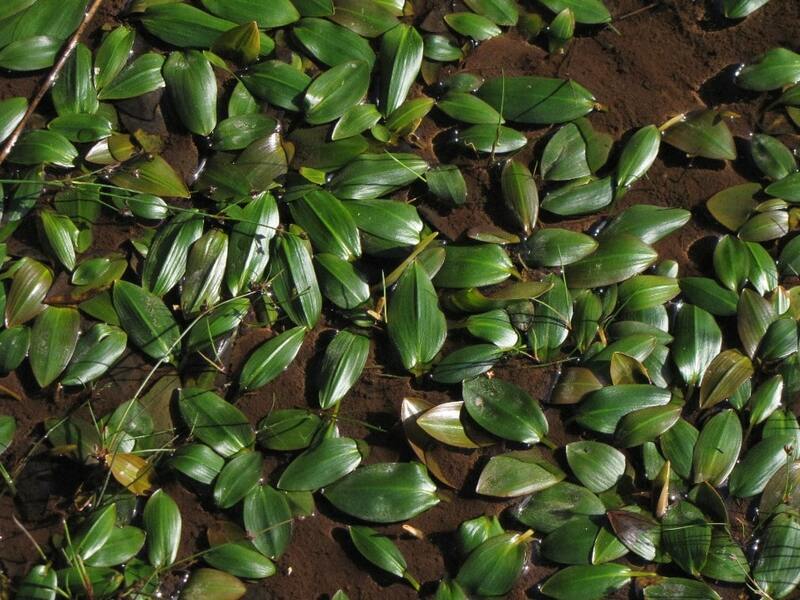 This was almost completely covered by the neat, very shiny, water-repellent, floating leaves of bog pondweed (Photo 18). 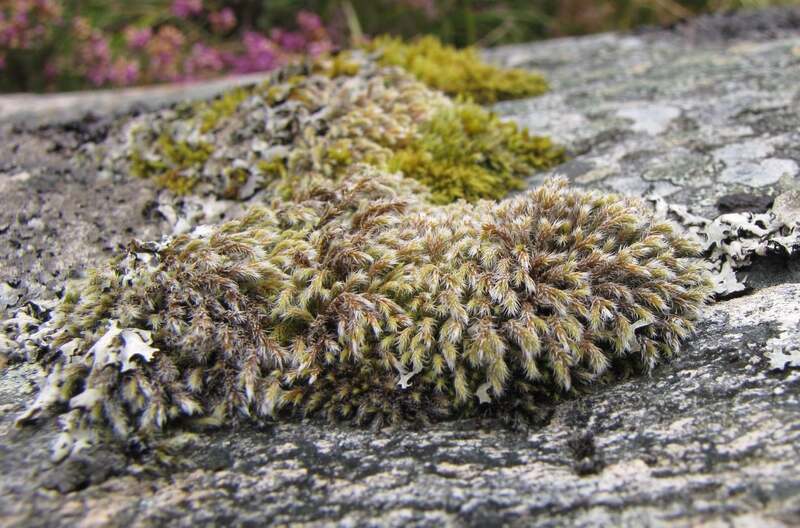 It is not a showy plant, but typical of acid, shallow water, habitats in Assynt and imparts its own visual texture to these small areas of the landscape. It also has the merit of being one of few instantly recognisable members of an otherwise quite challenging family of aquatics. After an enjoyable hour and a half, I was back at the entrance to the track, and made one last detour before leaving. Just along the road, towards the bridge over the Oldany River, is a small pool that I often notice as I drive past (Photo 19). It may perhaps have originated as a borrow-pit during road construction well over a century ago. Be that as it may, the deeper water in the centre is covered with a floating mat of bog moss Sphagnum spp., in a colourful range of greens, yellows and reds. Round the edge is a narrow channel of open water. 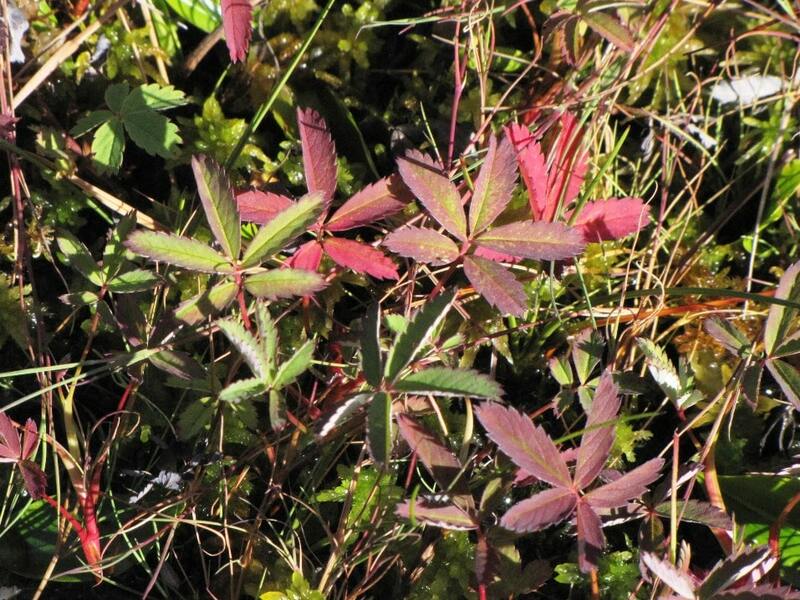 It was here, in our early visits to Assynt more than thirty years ago, that we first came across the attractive, five-fold, bluish-green leaves and deep-red flowers of marsh cinquefoil Comarum palustre. In late summer the leaves turn lovely shades of red and purple (Photo 20); a good place to round off my Oldany walk.